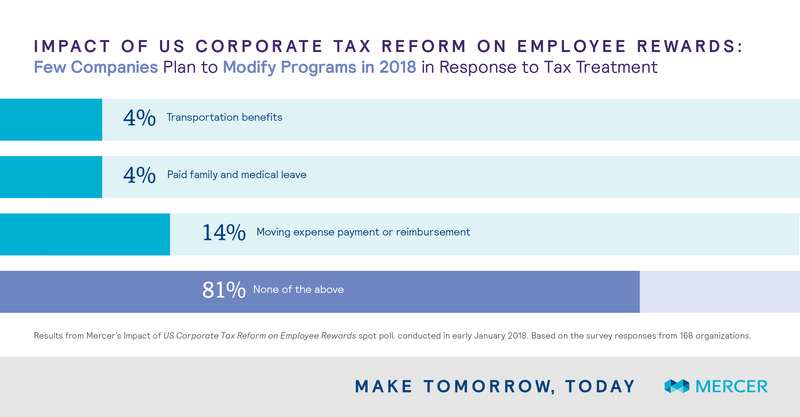 According to our Impact of US Corporate Tax Reform on Employee Rewards spot poll, conducted in early January, roughly one-third (32%) of the 241 companies who participated expect to redirect some portion of corporate income tax savings into employee reward programs. The prevalence is even higher, 43% when examining the responses of those participates that noted their company would actually see a significant reduction in their effective tax rate. In the time since the U.S. Tax Cuts and Jobs Act passed, we’ve seen several high-profile reports from companies announcing plans to redirect tax savings into increased minimum wages or one-time bonuses for their employees, most of which provide a burst of goodwill to their employees or support a need for more competitive wages. However, our survey results reveal that employers are considering a broader range of actions that go beyond quick hits. 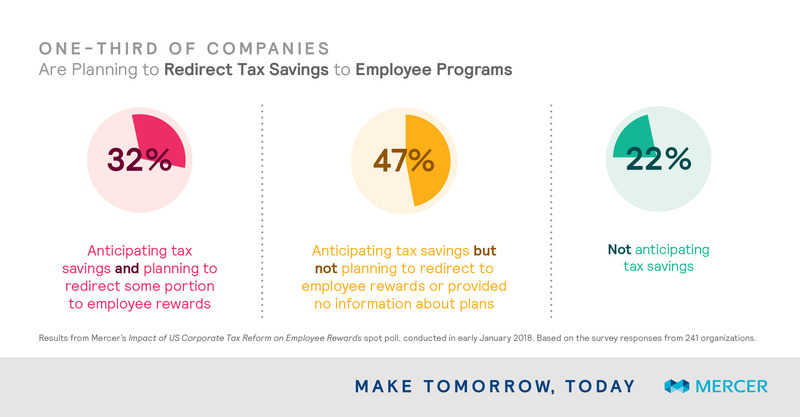 In fact, more survey participants said that they anticipate increasing "investment in employee training and development programs" with redirected tax savings than any other action, signaling that many companies are looking for longer-term investments in human capital. The survey collected responses from employers that varied in company size and industry with a split between publicly held (56%) and privately held (44%) companies. In examining results by company size, we start to see differences in anticipated plans between large, mid-sized and small companies. Large companies were more likely to indicate that they anticipate taking actions related to compensation whereas small and mid-sized companies anticipate making more long-term investments in employee programs, such as training and development. 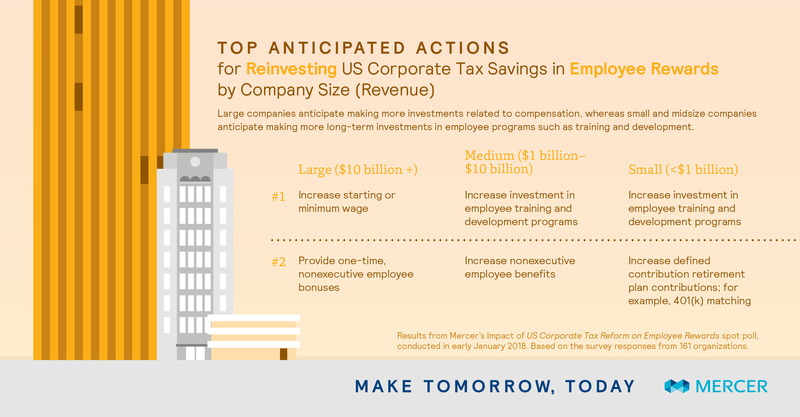 When we look across industries, for those where we had adequate sample sizes, we also see differences emerging in the top anticipated action for redirecting tax savings. Participants within the financial services and insurance industries anticipate making compensation-related actions whereas those in manufacturing, high-tech and consumer goods anticipate more long-term investments. Included in the tax reform bill are specific changes to tax treatment in employee programs like transportation benefits, paid family and medical leave and moving expense payment or reimbursement. Despite these changes, few companies (19%) reported plans to modify their programs. 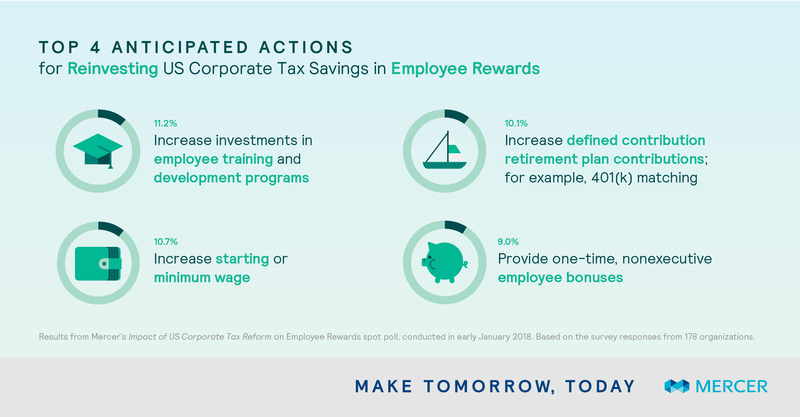 As with any strategic human capital investment, what employers choose to do needs to align with their overall business and people strategy, leaving many companies still in the process of carefully evaluating their approach to investing in employee reward programs with tax savings. This presents a great opportunity for HR leaders to assess the total rewards framework they have in place and recommend investments that will have true impact on the health, wealth and careers of their employees. 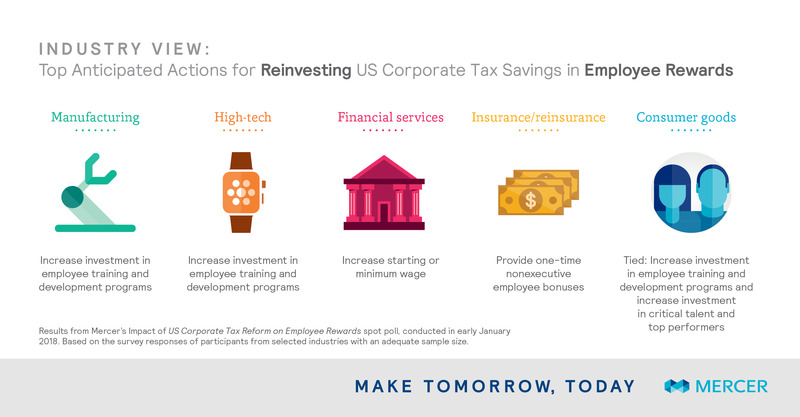 Investments that close gaps in pay equity, address competitiveness issues with key talent, or help build the workforce needed for the future, are all ways in which an organization can positively utilize tax savings for their workforce. If you’re not sure where to start, Mercer's consultants can help you think through the right options for your company and your employees. Complete the form below and a Mercer representative will be in touch soon to discuss your needs. US Tax Reform: What’s next for employers?